Hogenakkal falls is a beautiful waterfall on Cauvery river located on the Dharmapuri district of Tamilnadu - a state in South India. 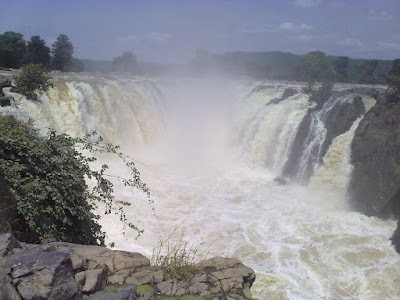 The falls of Hogenakkal is very famous and many people are coming here to see the falls. 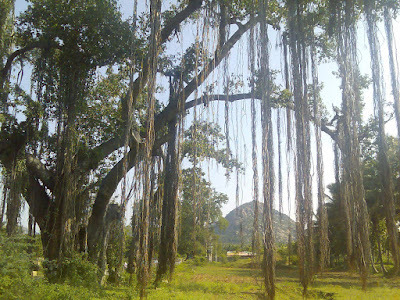 The spot is 180km from Bangalore and 46 km from Dharmapuri town. It is believed that the word Hogenakkal is formed from the combination of Hoge(Smoke in Kannada) and Kal(Rock in Kannada). 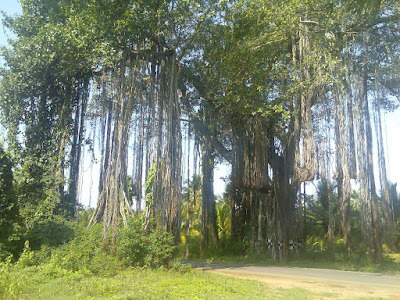 It is also called Marikottayam. To visit Hoganekkal falls in this Dasara holidays was one of my friends idea. To say honestly its was proved to be a good destination. We (6 people in total) started from Madivala(Bangalore), I joined from Electronic City(Bangalore) around 6.45 in the morning. As usual NH7 was another river of vehicles, problem with this river is that, its not flowing smoothly(thanks to ongoing construction works). 'n' number of blocks. In each and every block people are anxiously waiting to move to their private world. Couples are desperately waiting for some gaps to move on. Who want to waste a holiday on roads? In one car an innocent child -with total disregard for the circumstances - is looking around. May be to laugh at the humans who doesn't have the patience to wait for some time. Many people in other vehicles are doing many things to get the attention of this innocent one. In their day to day life they may do many things to get the attention of the boss but here in the middle of this traffic jam this small child is the center of attraction. 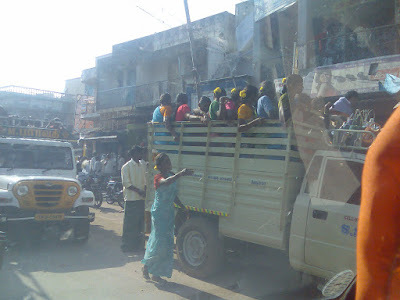 After the blocks were over we gain speed and moved towards Hosur. As we already know taking right from Hosur and took another road instead of NH7 will save many kms. Again who want to increase the cost of journy? So we turn right and started towards our destination. After some time i saw the entrance of Hosur Railway station. How can I forget this station? In the last time when i was coming back from home in Yeswantpur Express, i was supposed to get down at this station. That story goes like this. According to the railway touch screen in Palakkad station. Train will reach Hosur sation at 5.10am or around. In addition to that there is not even a single stop between Salem and Hosur and above all train is on time. Some minutes before the 'right time' it reached a station and stopped there. As Salem is already over (time too is correct), i though this may be the Hosur station. I asked to some people who are standing on the door. They dont have any idea. So i get down at that station and in order to check the name i started running towards the board on one end. It was the first time I am using this route - usually i use bus or Island express- moreover I never saw Hosur station before. Before I can read the board train starts moving, leaving me alone in that deserted place. 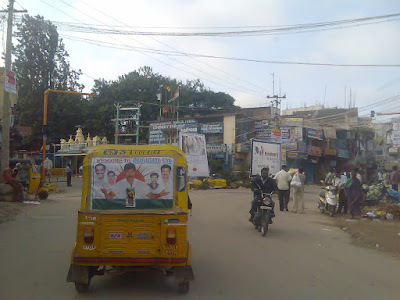 Board reads 'Marandahalli' not Hosur!!! Train already gained speed and moved away. After that i sat their for an entire 45 minutes to get the next train which came around 5.50am. Atlast I reached Hosur station in the middle of rain and from there boarded a tightly packed bus to reach Bangalore(In bus i was on the second last step with all the luggages!!! Motion was sevrly restricted). 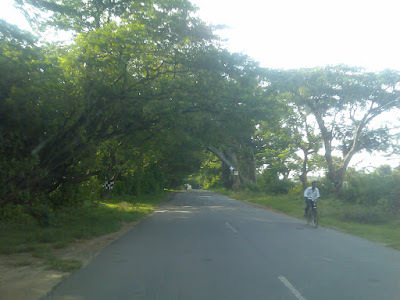 From here onwards, a good number of trees are visible on both sides of the road forming a curve accross the road. Occassionaly some small hills too. Sometimes buses came in the opposit side, all are tightly packed, looks like they trying to create new equations for atomic packing dimensions. In one bus there are some 20 pople above the bus. How the conductor will reach them? 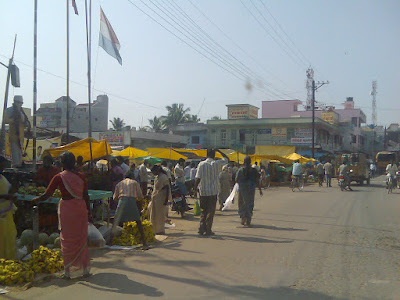 Occassionally we saw many small towns, where people are sitting in both sides to sell their agri products. If we saw these calm and barely populated places none will be able to say that Bangalore is only some 50-70 kms away. With an empty stomach nothing will look good except food!!! So we start looking for a resurant, but it took considerable time to find out one. In h opposite side of the hotel there is pony standing on the road. I asked one of my friend to took a photo of me and pony. I approched him he started looking me through a corner of his eyes - may be thinking that what he wants now? Thinking about about the power of his back legs and his easiness to move his legs in any way he wants I finally we dropped the plan. After all I have to reach Hogenekkal not hospital. The breakfast was good and cheap. The 'parippuvada' we bought from the nearby stall was very good indeed. Journey continued and after paying entrance and parking fees, we reached the banks of Cauvery river. From the entrance and before reaching the river the view from the road is veru good one. If you are lucky you can saw many monkeis too. After much bargaining we reached a common accepable charge for a 'Coracle'. These coracles are made from Bamboo, covered with plastic seet and later a layer of tar to make it waterproof. These coracles can be used for a maximum of 7 people. To our surprise there were many Malayali groups on the spot. Most of them are from colleges in Kerala. We went to some 300 meters above the falls in our taxi and started our journey from there. This part of river is very wide surrounded with forest and we are going in the downstream. This is the third time i am seing Cauvery. First in Srirangapattam then in Talacavery, Cauuvery Nisargadhama and now in Hoganekkal. I want to see Cauvery delta too, where cauvery joins with 'Bay of Bengal'. 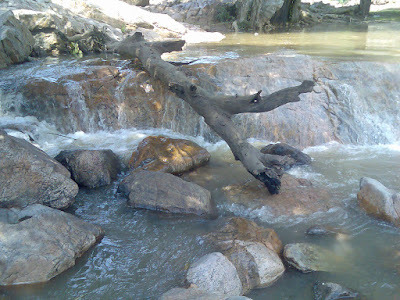 We went out from Coracle to the rocks near to falls started moving to the nearest possible point to saw the falls. It was a magnificent sight. There is an open channel some 20-30 metres deep in the river, water from cauvery is moving towards and finally fall in to this channel from three sides. This creates the Hoganekkal falls. The sight is wonderful, in the middle of the falls. we can see the white fog moving up, frequently small water drops came towards me just like a rain. The sensation is an enchanting one. Some 1 hour we spend there, I sat in a rock close to the falls and looked towards the falls. Nothing will come to mind, it will go blank. Just water, her music, rocks and beauty of surrounding forests. The beautiful concert will give you some everlasting memories. After that we moved again in our coracle and reach the other bank, this is the place for bathing, swimming etc. Except me and another one al others went for bath. We simplly sat in the banks, students from different colleges came there and njoying their tour. We simply talked to our driver- the person who drives the corcale. He told us that the next tourist place is Erkkad and it is some 140kms away. As we have to reach Bangalore today itself we were unable to reach there. After paying him we went to the near by hotel for the late lunch. After that we retraced our path and reach Bangalore around 18.00 hours. The one thing i didnt like is the selling of goods above the MRP or at the MRP level. For mineral water it is 1-2 Rs above the MRP. After coming to Bangalore in the last year i paid the cooling charge for the first time. Cooling charge 1 Rs/bottle for keeping mineral water bottle/juice bottle in refrigerator.